대방광불화엄경은 줄여서 ‘화엄경’이라고 부르기도 한다. 우리나라 화엄종의 근본경전으로, 부처와 중생은 둘이 아니라 하나임을 기본 사상으로 하고 있는데, 『보현행원품』은 화엄경 가운데 깨달음의 세계로 들어가기 위한 방법을 보현보살이 설법한 부분이다. 이 책은 고려의 이야선불화(李也先不花)가 자신의 무병장수와 일가친족의 평안을 빌기 위해 간행한 『금강경』, 『장수경』, 『미타경』, 『부모은중경』, 『보현행원품』 가운데 하나이다. 검푸른 색의 종이에 금색으로 정성스럽게 옮겨 쓴 것으로, 병풍처럼 펼쳐서 볼 수 있는 형태로 되어 있으며, 접었을 때의 크기는 세로 26.4㎝, 가로 9.6㎝이다. 표지에는 금·은색으로 꽃무늬가 묘사되어 있고, 그 중앙에 ‘대방광불화엄경행원품’이라고 금색으로 쓴 제목이 있다. 책 머리에 행원품의 내용을 요약하여 묘사한 변상도(變相圖)가 금색으로 정교하게 그려져 있다. 책 끝의 간행기록에 간행연도가 지워져 있어 정확한 연도를 알 수 없으나, ‘지(至)’자로 시작되는 점과 책의 품격으로 보아 고려말인 1341∼1367년 사이에 이루어진 것으로 추정된다. 원래 일본에 전래되었다가 되돌아온 것으로 습기로 인해 간행기록 등 몇 곳에 훼손이 있으나 그 외에는 보존상태가 양호하다. 특히, 변상도 뒷면에 ‘행원품변상문경화(行願品變相文卿畵)’란 글씨가 있어 변상도 작가를 밝히고 있는 점에서 중요한 자료로 평가된다. 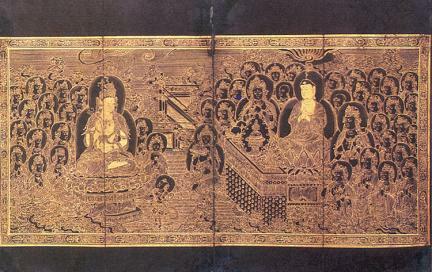 Daebanggwangbul Avatamsaka Sutra is also called by its shortened name the Avatamsaka Sutra. 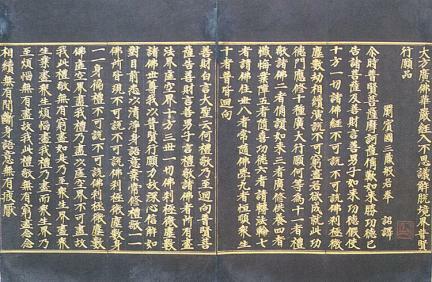 This is the principal scripture in Korea's Avatamsaka Sect. The main idea in this Buddhist scripture is that the Buddha and all other living things are not two different entities, but one. 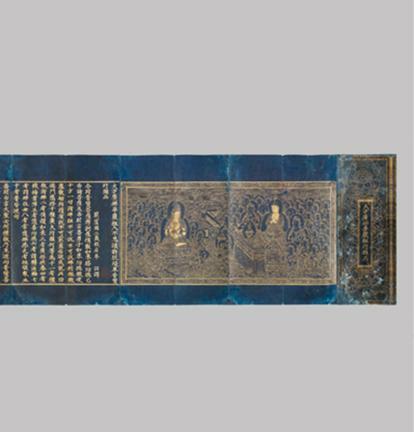 Among many books in the Avatamsaka Sutra, the Book of Bohyeonhaengwonpum contains the teachings of Samantabhadra Bodhisattva that show how to enter into the world of enlightenment. 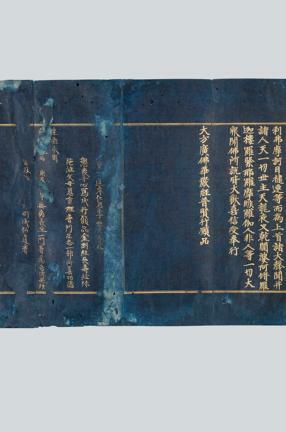 This book is one of the five books, consisting of The Book of Geumgang, The Book of Longevity, The Book of Mita, The Book of Parental Grace and Bohyeonhaengwonpum that are published by a man called Yiyaseonbulhwa of Goryeo Period with a prayer for his own health and longevity as well as the well-being of his family. The contents are hand-written with all his hearts in gold ink on the pieces of blue papers. 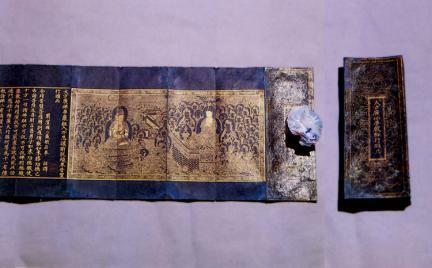 It is made in the form of a folding screen 9.6cm long and 26.4cm wide. 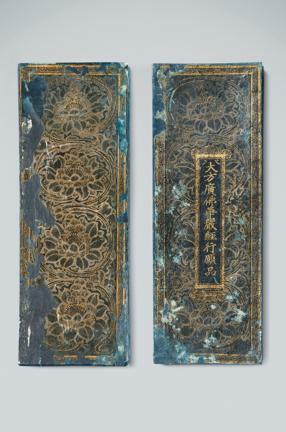 There are flowers described in gold and silver color on the cover. 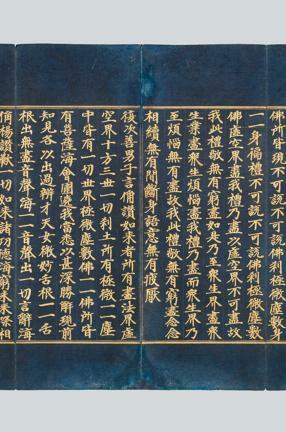 At the center of the cover is the title of the book Bohyeonhaengwonpum (Daebanggwangbul Avatamsaka Sutra Haengwonpum) written in gold. 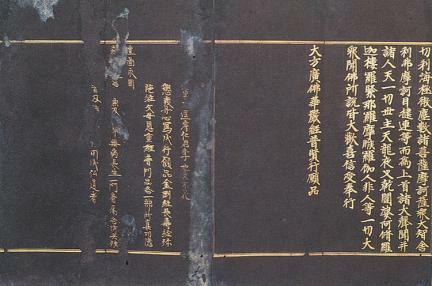 The first page of the book shows a fine piece of painting sophisticatedly colored in gold, which describes the summary of the book. The exact year of production is not known because the year written at the end of the book is erased. 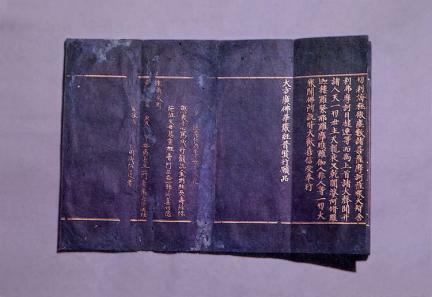 Nonetheless, the fact that the content of book starts with the character 'ji (至)' as well as the overall quality of the book implies that this is published sometime between 1341 and 1367 at the end of the Goryeo Period. This book had been kept in Japan until it was retuned recently to Korea. Besides the damage found in several places caused by excessive humidity, it is preserved in a relatively good condition. 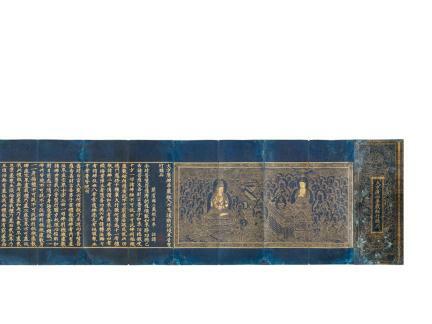 In particular, because the painting titled Haengwonpum byeonsang mungyeonghwa found on the back of the summary painting reveals the name of the artist who produced it, this book provides valuable information on the Buddhist art of the ancient Goryeo Period.